A simple filter named SAP (Practical Water Filter) is a water filter developed by the Sheep Indonesia Foundation (YSI). The research and development through small-scale production was funded by Friends Peace Teams from 2009 through 2011. The number of disasters that have occurred in Indonesia have made this filter invaluable for survivors to fulfill their needs for clean water, especially for drinking. In 2016, YSI distributed aid filters to survivors of the eruption of Mount Sinabung in North Sumatra which spread in six villages and as many as 300 units of refuge were established in this area. In November 2017, when a prolonged drought occurred in Sabu Raijua, East Nusa Tenggara, YSI assisted with 300 water filters in five villages. Priority recipients of water filter assistance agreed upon by the community were for poor families with a large number of family members. In August 2018 when an earthquake struck Lombok in West Nusa Tenggara, YSI provided 300 water filters. In November – December 2018 the Sheep Indonesia Foundation plans to distribute 500 units of water filters to survivors in Palu and Donggala who were affected by the earthquake and tsunami. The aid of water filters to the survivors of Mount Sinabung eruption, drought in Sabu Raijua, Earthquakes in Lombok, earthquakes and tsunamis in South Sulawesi was supported by the DKH (Diakonie Katastrophenhilfe) German. Water filters made by YSI are very helpful because they are more practical, save energy (without boiling water) and do not require much energy or cost to get drinking water that is suitable for family consumption. One of the mothers from Raijua who received the Water Filter, in November 2017, Sabu Raijua, Photographer: Kristina, YSI staff. 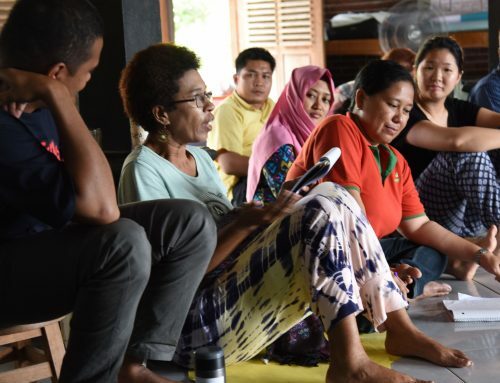 The practiced of installing filters for training in using of water filters for earthquake survivors in Lombok, West Nusa Tenggara facilitated by Haryoso YSI staff, in September 2018. Photographer: Evi YSI staff.